A couple of friends and I were birding around Jamaica Bay in New York a few years ago. We came upon a couple of people, a man and a woman, looking out over the water and discussing a bird perched in plain view, but a bit distantly, out in the marsh. They didn’t seem to be birders (judging by their lack of optics), but one of them suggested it could be an Osprey. I took a look with my binoculars, easily saw the relevant field marks due to the benefit of magnification, and assured them that yes, it’s an Osprey. The woman replied “Could be” as they were walking away. What kind of hawk is this? Larger pictures available here. Read more about this bird below. More recently, I found a hawk on our property. We haven’t had a lot of raptors on our farm, not even migrants. I’ve been hoping for more buteos, and as soon as I saw this bird I knew it was a new species for us. However, I also knew it was going to be a tough ID. It seemed to be a young hawk, smaller than a Red-tail, perched on a dead branch in the morning fog. I immediately had it down to two species: Red-shouldered or Broad-winged. But which one? I quickly digibinned a few pictures, taking breaks to look more carefully with my binocular. I really wanted to see the top of the wings, so I decided to walk around the row of pine trees beside me and have a better angle on the bird’s back. I quickly but quietly moved around the pines, and of course the bird was gone. Fortunately I had the pictures, and headed indoors to clinch an ID. necessarily, but just trying to indicate that they weren’t some random person who started birding yesterday; they had time and experience and background with this subject. A couple of my birding friends agreed with Red-shouldered, but then a couple said Broad-wing, and then a couple more from the email list also said Broad-wing, so I was faced with a split vote. I really wanted to add this bird to our property list, so what to do? I joined the ID-Frontiers email list to post a message about this bird. I included a link to the pictures, hoping to gain some insight from those on the ‘frontiers of identification.’ I knew that there were a few people on the Ohio-Birds email list who also subscribed to ID-Frontiers, but I hadn’t heard an opinion from them. Based on the split vote, I thought that moving it up to a higher court was acceptable. But what do I mean by acceptable? Aren’t birders available to help others, would anyone judge you for asking a stupid question? I mentioned to my wife I was thinking about emailing Sibley to get his opinion. She was incredulous: can you just email Sibley? I felt like it was an identification question that was worthy of expert advice; I’m not a new birder sending out a fuzzy picture of an obvious Brown Pelican. I have some idea what I’m talking about and didn’t know what this hawk was, and other people couldn’t agree, so I didn’t think I’d be wasting anyone’s time. I knew many respected birders were on ID-Frontiers, and I would get some good feedback. I received three responses; the one I weighted highest came from Bill Clark, co-author of the Peterson Field Guide to Hawks of North America. He said it was a Broad-winged, and I took that as the final answer. ever dealt with have distinct but subtle horizontal patterns on the breast, not the vertical ones on your provided photo…Redtails (except in the vary rare melanistic specimens) always have the central, upper breast lighter than the belly band or flanks of the upper breast (chest area), exactly as on your photo of your bird. Red-shouldereds and Broadwings have evenly hued coloration and evenly-patterned upper breasts. But the lack of horizontal patterning on the upper or middle breast negates a Broadwing for me, and the presence of a less-patterned, slightly lighter central area on the upper breast marks the bird as a Red-tail for me. I’ve trapped, banded, and rehabbed many dozens of Buteos in 40 yrs of working with these birds. John A. Blakeman”. majority, or choose voices here and there? Maybe this bird was a hybrid, or a ghost (I mean a literal ghost, not one of the two species we sometimes call ‘gray ghosts’)? whether we were right or wrong. Even if we move it to a higher authority, we can’t know for sure if they were right or wrong. One of the people who corresponded with me suggested I try whatbird.com; the site includes a forum where people will help you identify birds. Many people post pictures, hoping to find someone knowledgeable to determine the bird’s identity. Many times the responses say something like, “Chipping Sparrow. Confirmed.” That is supposed to mean that the person doing the confirming knows what the species is, and they know that they are right. But how do any of us ever know that for sure? When I decided to write this post, I emailed all of the participants in the discussion and asked whether it would be okay to use their names and responses. A couple were reticent at first, they wanted to check what they had said to me before having it thrust upon a larger birding audience. Why is that? identification arises. Sometimes the best identification is ‘I Don’t Know‘, but we don’t usually want to admit that fact. Even worse is proposing an incorrect identification. This has the obvious side effect of stifling discourse and preventing knowledge from being shared. I was impressed when Birding began running photo quizzes where different birders explained their identification and how they got there. This prevented a consensus view from clouding perception and coloring judgment. Sometimes the experts differed, and I don’t think there is anything wrong with that. Maybe there was no right answer (hybrids…or ghosts). 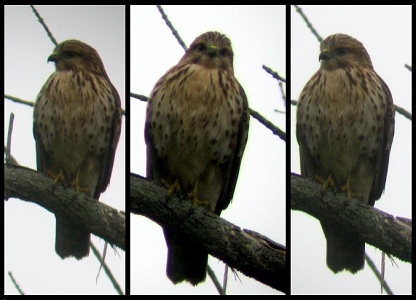 My point with this post is not to decide what kind of hawk is in the pictures, or decide which birders are better than others. I wanted to point out that we perceive different levels of birding expertise, and there are people and organizations we are more likely to believe. It isn’t always clear why we choose to believe some people over others, or how we pick which ‘experts’ to consult. The next time you are out birding and run across someone grossly misinformed about the identification of a bird, feel free to do your best to correct their obvious error. Just remember, they may be trying to do the same thing for you. Blake Mathys completed his Ph.D. at Rutgers in 2010, studying evolution of birds introduced to islands. His field work was in Bermuda, Puerto Rico, Hawaii, and Trinidad, and was complemented by museum research. Prior to graduate school, he worked with Cape Sable Seaside Sparrows in Everglades National Park, as a hawk counter in Washington State, on the Farallon Islands studying Northern Elephant Seals for PRBO Conservation Science, and sampling fish for the Ohio EPA. Blake and his wife Dimitria recently moved to Ohio, where he is an Assistant Professor of Environmental Science at Ohio Dominican University in Columbus. Aside from birds, he maintains a fascination with salamanders, mammals, and anything else with a backbone.